One can quickly put music on iPhone 8 using the iMyFone TunesMate iPhone Transfer. This is a third-party software developed by iMyFone as the iTunes ultimate alternative to moving media content between your iDevice and computer efficiently. It runs both on the windows and OS X platforms. It lets you transfer music videos and even other files to iPhone 8/X from PC/CD/External Hard Drive/USB Flash Drive easily. Two-way transfer that freely moves data between an iOS device and iTunes or between iOS device and PC, in either way unlike iTunes which has only a one-way transfer. To import music to iPhone 8/X from PC/CD/External Hard Drive/USB Flash Drive using iMyFone TunesMate, please follow the below steps. Step 1. Launch iMyFone TunesMate on your computer and connect your new iPhone 8/X with a compatible USB cable. Step 2. Click on the “Music” icon to go to the music window. Step 3. 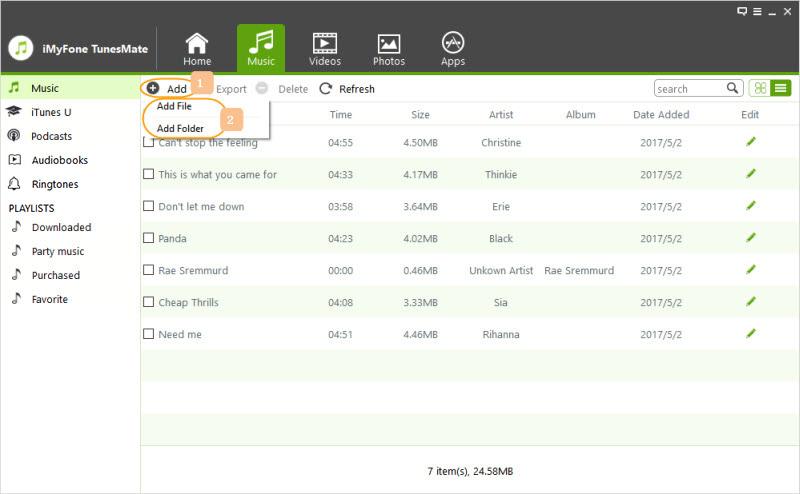 Tap “Add > Add File/Folder” from the top menu to transfer music from your PC/CD/External Hard Drive/USB Flash Drive. Step 4. Then from the window that pops out navigate to where your music is depending on whether it is on your PC/CD/External Hard Drive/USB Flash Drive and click open to transfer the selected folder or tracks to your iPhone. v.	Launch iMyFone TunesMate on your computer and connect your old iPhone with a USB cable. vi. Click on the “Music” icon to go to the music window. vii. 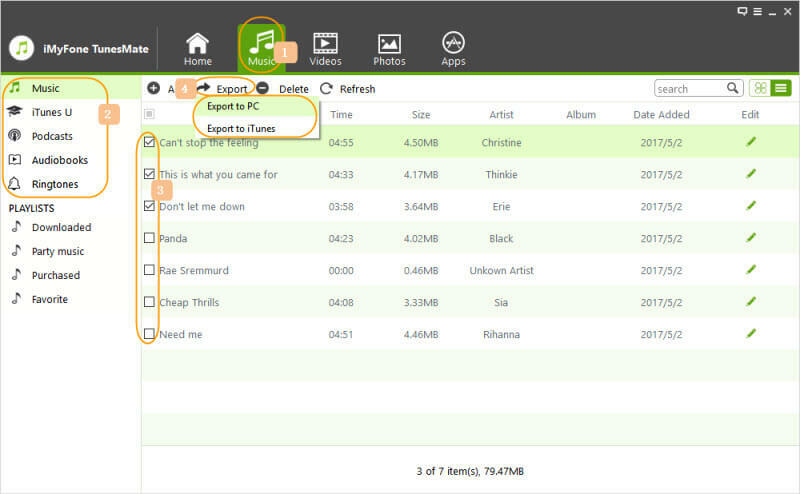 Select all the songs you want to export and then click “Export > Export to PC” from the top menu. viii. Select the target folder from the window that pops out and then tap” OK” to begin the export. ix. After the “Export Successfully” window pops out click “OK” to close it. i. Disconnect the old iPhone and then connect the new iPhone 8/X to your computer via a cable. ii. From iMyFone TunesMate interface click on the “Music” icon to go to the music window. iv. 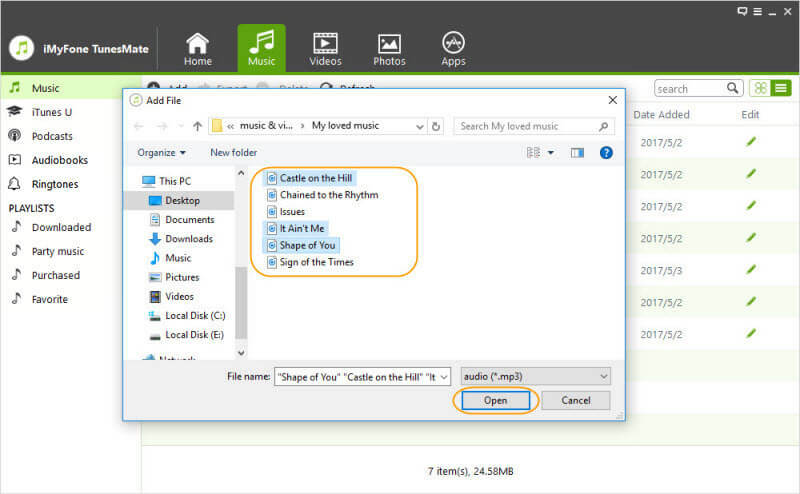 Navigate to the folder which you exported the music from your old iPhone to on your computer. v.	Click open and all the music in that folder will be transferred to your new iPhone 8/X. When it comes to moving select tracks or your entire library from your computer to iPhone 8/X, iTunes is the most familiar way to sync media content including music. 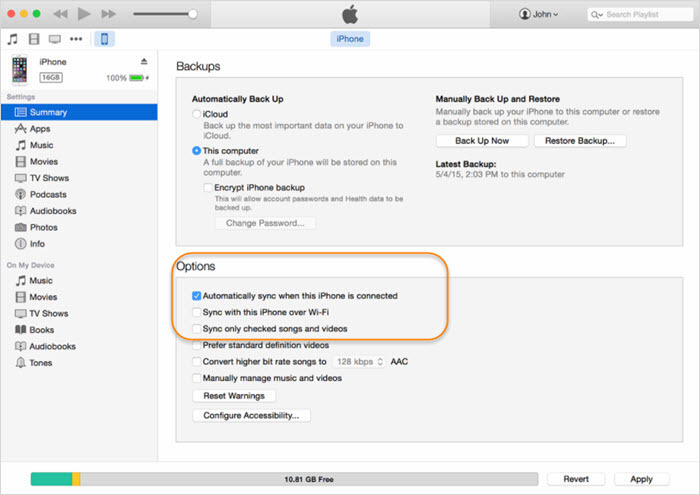 However, despite it being the official and sole way provided by Apple to manage and transfer your iPhone music library it is not as easy as it sounds and is genuinely challenging for newbies. 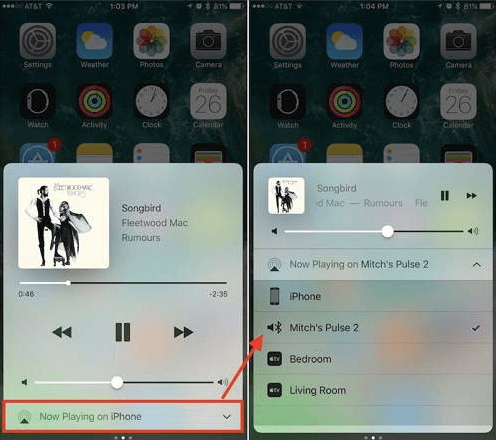 To transfer music to your iOS device with iTunes sync. Step 1. Launch iTunes on your computer and then connect your iPhone 8/X using a compatible USB cable. Step 2. If it is the first time you are connecting your iDevice, tap on “Continue” on the window that pops out and then “Trust” on the dialog that follows to allow iTunes to read your iPhone 8/X. Step 3. From the iTunes, interface click on the phone icon in the left corner. Step 5. Once done go to iTunes menu and then click on File > Add File to Library to import any music tracks you want from your PC to your iTunes library. Step 6. Now, click “Music” under “Settings” tab and Choose “Sync Music” to sync your entire library or selected files to the connected iPhone 8/X. If you’re failed in transferring music to iPhone 8/X using iTunes, you can always turn iMyFone TunesMate, which allows you to transfer all iTunes music to iPhone in just 3 clicks, even without opening iTunes. Another way you can to transfer music to iPhone 8/X is through the use of Airdrop, an Apple built-in utility that enables you to move media content from one iOS device to another. However, AirDrop is only able to send music one by one, so it is highly recommended to try iMyFone TunesMate. Step 2. From the iPhone, you want to transfer music from open the Music App and then go to Songs. Choose a certain song. Step 4. Go to the iPhone 8/X you wish to move Music to and then tap Accept option to receive the music transferred by AirDrop.